We are pleased to extend an exclusive invitation to our loyal customers to our SALE from 10th February to 10th March 2006 at selected outlets. Get fabulous discounts and enjoy great buys during this period. I received the above mentioned email recently. So Rizalman is having sales. Woohooo!!! In case you don't know, Rizalman Ibrahim is one of our local Malaysian designer who actually made it to the top in this industry. OKOK, not like I HAVE bought any of his collections. But I ALMOST did. 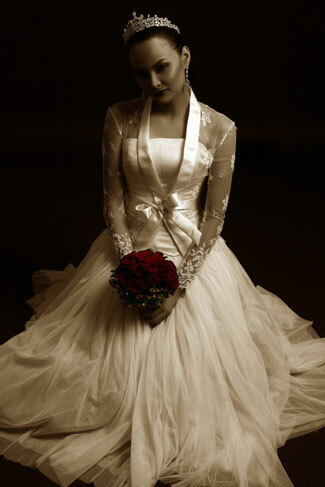 I fell in lurveeee with 1 of Rizaman's bridal gown collection. If not mistaken should be 2005 collection. Lovely isnt it??? I don't know what is the ummphhh factor that got me gaga over this dress but i guess its partly the photography, partly the tie-em-up ribbon, partly the tiara. But all in all, I tot this is THE PERFECT wedding dress for me!!!! hehe.....not that the price IS the factor because If i had insisted for it, hubby dearest would gladly allow me to have it. However, time did not permit as I was totally running out of time. Plus, I was "ding-donging" in my mind if i should do it or not (get the dress done). In the end, futunately for hubby dearest, I decided against it la, I wouldnt have enough time to get it made on-time for my photography session anyway. Soooooo, if you like couture, if you have the $$$, head over to rizalmans and tell him Fashionasia sent you!!! I dah lama fall in love with him and his creations. Mmm...hunk. Anak angkat dia, Umar pun adorable. Mana gambar kawin u?nak la see the dress..boleh?